Exeter hat, knit in Patons Bluebell Merino 5-ply (sport weight). Okay for a yarn, but certainly not my favourite. It's cable plied, and I just don't like the look and feel of it. Don't think I'll use it again. This yarn has been in my stash for some time - I bought it ages ago with the plan of making Deane some fingerless gloves, but just never got around to it. He bought some cheap nasty ones from the $2 shop anyway, so he can go jump ;-) I knit the hat to 8.5" before starting the decreases, which seems to be the general consensus among people who've already knit this hat. The 9.5" as recommended in the pattern seems like it would be just that little bit too long. I'm happy with how it came out, even if it never gets worn. 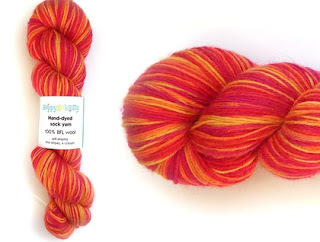 Self-striping sock yarn from happygoknitty!! (Picture from online store, used with permission). So its not exactly red and orange, but hopefully it'll be close enough. Again with the selfish motives... I've been wanting to try this yarn for some time, as I have seen it at markets and heard about it from others. It's 100% BFL (blue-faced leicester) which, apparently, is good hard-wearing sock yarn that isn't awful and scratchy. And it won't need a fancy lace pattern, or cabled pattern, or any other pattern, because it knits up stripy! How awesome is that?!? I'm thinking I'll do afterthought heels, so I don't break up the stripe pattern. Thanks to Sock Madness for getting me to learn yet another technique... (Plus, I'm interested to see how fast I can knit a sock, after seeing this video. Sure, he knits a heel flap and gusset, but I figure a heel's a heel, right? Don't think I'll be doing a time-lapse photography thing or anything though (although that would be fun!) - I just think it would take me way longer than five hours. I'm guessing that guy's a pretty fast knitter). It's a little hard to tell from the pictures, but there's beads in that there sock!! It's so pretty!!! Much better in 'for true life' as my boys would say. What's also hard to tell from the pictures is the seriously awesome colour they are - a dark, rich royal purple. So beautiful. I'm knitting them in Vintage Purls Porphyrogenitos, which was the sock yarn club release for the Murex socks. I'd link to the sock pattern, but it hasn't been uploaded onto Ravelry yet :-( I liked the socks, but not enough to want to knit it. I figured the colour was perfect for Sock Madness, and I found some matching beads. Mother's Day - success at last!